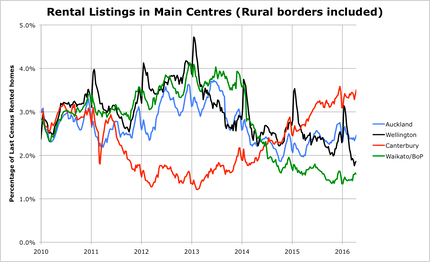 Waikato/Bay of Plenty listings are now rising, recovering from a severe shortage, however there may be a lot more room to grow because listings are only 1.5% of rental properties, against a long term trend of maybe 2.5 - 3%. The continuing reduction in Wellington properties being listed suggests a strong opportunity for investors. 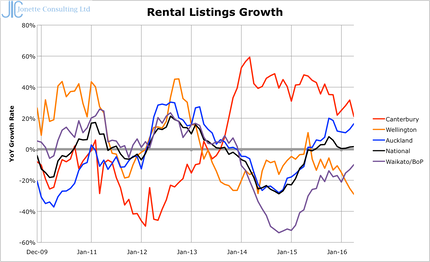 �The growth rate of listings has hit another low and does not look like improving. �This suggests yield improvements, through rental price rises, is likely to be happening now and is likely to continue. Christchurch seems to be levelling off, now that it is in bust territory thanks to the building boom initiated by the government - as they are doing in Auckland. �The bust does not look likely to get worse, but equilibrium may take a while.